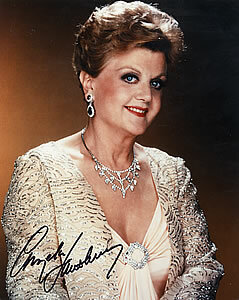 Star of stage, television, and the silver screen, Angela Lansbury was born to an upper-class British family. Her father, a lumber dealer, died when Lansbury was nine, and at ten she saw Sir John Gielgud on stage at the Old Vic as Hamlet, and decided by intermission that she would become an actress. At 14, amid the blitz of London, her mother took Lansbury and her twin brothers to America. She made her professional stage debut as a cabaret dancer at 16, after telling the club's management that she was 19. She made her Broadway debut playing Bert Lahr's wife in the 1957 bedroom farce Hotel Paradiso, and had her first starring role -- and her first hit -- in the 1960 play A Taste of Honey with Joan Plowright and Billy Dee Williams. She was Broadway's original Mame, and starred in New York productions of The King and I with Yul Brynner, as Gypsy Rose Lee's mother Mama Rose in Gypsy, and as the baker of human meat pies in Sweeney Todd. She won five Tonys over her stage career, winning every time she was nominated. She has been Oscar-nominated three times and Emmy-nominated a remarkable 18 times, and never won either award. Her widest fame came on television as Jessica Fletcher, the retired English teacher who became a best-selling mystery writer, with a hobby of solving murders on Murder, She Wrote. Over a dozen seasons and hundreds of episodes, Fletcher was suspiciously always in the vicinity when murder most foul was committed, and the show became a haven for old-time movie and TV stars from Linda Blair to Cesar Romero. In very special episodes she traveled to England to assist the Scotland Yard, and to Hawaii to hobnob with Tom Selleck's Magnum, PI, and after the series was cancelled Lansbury returned as Fletcher in several made-for-TV movies. Lansbury has said that her only regret is that she never had the opportunity to star in films, but she was occasionally a movie star, and turned in some unforgettable supporting roles. In her film debut at age 19, she played the Cockney, saucy maid in the haunting thriller Gaslight with Charles Boyer and Ingrid Bergman, and in the classic National Velvet she played 12-year-old Elizabeth Taylor's older sister. In the 1945 film of Oscar Wilde's The Picture of Dorian Gray with George Sanders, she played his the music hall singer who became his first conquest. In many of her films while under contract to MGM she played the other woman, the star's best friend, the nagging wife, and other characters that offered little to an actress. In the original Manchurian Candidate she played Laurence Harvey's deliciously wicked mother, and she was undoubtedly the star of Disney's delightful Bedknobs and Broomsticks as an apprentice witch who dazzles young children and dances in mid-air with David Tomlinson. She had the nominal lead as the detective Miss Marple in the all-star adaptation of Agatha Christie's The Mirror Crack'd, and she voiced the teapot, Mrs. Potts, in Disney's animated Beauty and the Beast -- and sang the movie's Oscar-winning theme song. Lansbury's genealogy features numerous notable names. The family's show business tradition began with her great-uncle, Robert Mantell, a Broadway producer and star from the 1880s to the 1920s, who performed with Ethel Barrymore. Lansbury's mother was Moyna MacGill, a successful actress on the London stage and star of several silent films in the early 1920s. MacGill's first husband, before she married Lansbury's father, was movie director Reginald Denham, best known for directing Vivien Leigh's pre-Gone With the Wind comedy The Village Squire, and writing the thriller Ladies in Retirement starring Ida Lupino and Elsa Lanchester. MacGill and Denham's daughter Isolde Denham, Lansbury's half-sister, married actor Peter Ustinov and spawned well-known British stage actress Tamara Ustinov. After her children were grown, Lansbury's mother resumed her acting career, mostly appearing in small roles as eccentric Englishwomen in films from the 1944 Jane Eyre with Joan Fontaine to My Fair Lady with Audrey Hepburn and Rex Harrison, and she appeared on Broadway in the 1954 production of The Boy Friend with Julie Andrews. Her brother is Bruce Lansbury, the long-time Hollywood producer of enjoyably fluffy TV shows such as The Wild Wild West with Robert Conrad, Mission: Impossible with Peter Graves, Wonder Woman with Lynda Carter, and Knight Rider with David Hasselhoff. Bruce Lansbury's twin, Edgar Lansbury, is a very successful stage producer whose biggest hits include the original New York production of Godspell and the Broadway debut of The Subject Was Roses with Jack Albertson and Martin Sheen. He also produced the feature films based on both plays, and won a Tony for The Subject Was Roses. Lansbury's first husband was actor Richard Cromwell, who played Henry Fonda's brother in Jezebel with Bette Davis, and was one of the boys defended by Fonda's Abraham Lincoln in Young Mr Lincoln. Their marriage fizzled, and Lansbury later said she never knew he was bisexual until they were divorced. Her second marriage was to then-struggling actor Peter Shaw, who had his biggest success with a supporting role in the 1939 film Sons of the Sea with Kay Walsh, and had a tiny role in Bride of Frankenstein with Boris Karloff. After marrying Lansbury, he became a top executive at William Morris Talent Agency, and was later credited as producer of Murder, She Wrote. Her son, Anthony Shaw, is an erstwhile actor who had tiny roles in numerous films in the 1970s and '80s, and has worked as a director, exclusively in projects starring Angela Lansbury. Her daughter, Angela Battarra, is a chef and co-owner of the Enzo & Angela Italian restaurant on Wilshire Blvd in Los Angeles. Her stepson David Shaw is a TV producer whose credits include the 1960s TV western Shane starring David Carradine, and his stepmother's Christmas telefilm Mrs Santa Claus. Lansbury's nephew is actor David Lansbury, who had supporting roles in films from Gorillas in the Mist with Sigourney Weaver to Michael Clayton with George Clooney, and is married to actress Ally Sheedy. Lansbury's cousin, Oliver Postgate, is beloved in England as the creator of popular children's programs including Bagpuss, Ivor the Engine, and The Clangers. His SmallFilms productions have been staples of British television since the 1950s, and even 25 years after production ceased on Bagpuss, it was named the most popular children's program of all time in a 1999 UK survey. Felicia Lansbury, another cousin, has worked occasionally as an actress, and was a backstage assistant for Penn & Teller. Her grandfather, George Lansbury, served in Britain's Parliament, led the Labour Party, championed the women's suffrage movement, and founded the socialist newspaper The World in London in 1912. Later renamed The Herald and still later The Sun, it is now a tabloid of little journalistic reputation published by Rupert Murdoch's News Corp. Speech, The Players' Pipe Night, where she was guest of honor, 21 October 2012: "It has been erroneously reported that I am a Republican! I am not a Republican. It's all over the Internet and It's bizarre. I'm a huge Obama fan. I've already voted for him by absentee ballot. I am Democrat from the ground up."